WHERE WAS THE SPORTLAND BOXING RING? BHHC members recently visited the Prince George’s Historical Society Library in Greenbelt to look for information that would help pinpoint the location of the boxing ring that is the subject of this year’s historic marker. They were shown several interesting maps of Prince George’s County, including a hefty 1940 plat book by the Franklin Survey Company. The plat book was once used by a real estate agency and had a wealth of information about the communities it covered. Berwyn Heights is depicted in two detailed plates that show practically every structure in existence at the time. The plate of Berwyn Heights, south side, has the Sportland property. 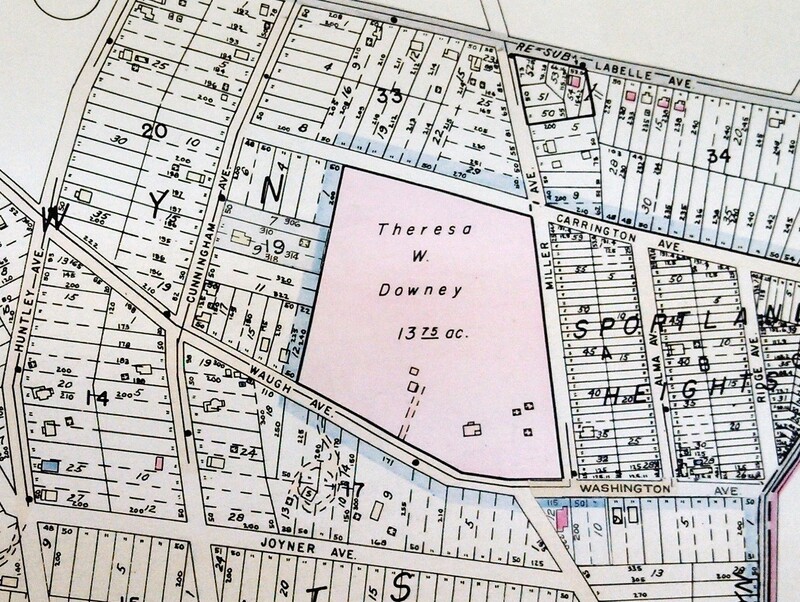 It is under the name of Theresa Downey, who assumed the mortgage for the property from her parents Maria and John O. Waters. One can clearly see the main house, several outbuildings and a path leading into the property from Waugh Avenue (Berwyn Road). While the boxing ring was no longer in existence in 1940, it is plausible that the ring stood at the end of the path. This squares with the location Ann Harris Davidson reports on page 31 in her book Berwyn Heights: Then & Now: west of the main house in a lower elevation, and with access from Waugh Avenue.